Recently laminate flooring has become one of the best selling floor coverings in Devon. But what exactly is laminate flooring? Laminate flooring is a tongue and groove interlocking flooring system. It is installed over the top of the existing substrate & simply lays there. Plywood, concrete slab, sheet vinyl flooring, hardwood flooring, or virtually any other basically flat hard surface is suitable for a "floating" laminate installation. This material is bonded to a moisture resistant wood composition based core. A balancing backing is bonded to the underside of the core. On the top is a clear cap sheet of Aluminum Oxide, which provides the protection and stain resistance. By using the counter top technology and adding considerably more resin to the wear layer, laminates have become an ideal floor covering. In fact, some laminate floor manufacturers boast that their laminate floors are now 10 to 20 times harder than laminate counter tops. Since this resin filled wear layer is so dense, it becomes extremely difficult to stain, scratch, or burn with a cigarette. It is possible however to scratch any floor. 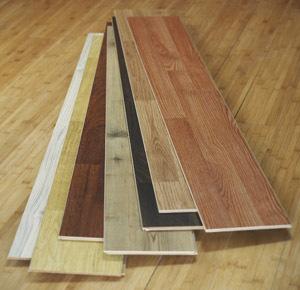 Aesthetically, the most common laminate flooring designs have a wood grain visual appearance. Some manufacturers have even released textures such as realistic stone and marble.